How many people does it take to change every light bulb in Grand Central Terminal? Six, it turns out. And it’s a full-time job. On Tuesday, those wiremen — their official title — unscrewed the last remaining incandescent bulbs in the building, replacing them with compact fluorescent bulbs and completing the greening of the lighting system at the bustling station. While the wiremen worked, photographers snapped pictures, and officials applauded the efforts, reminiscing about the days when both the station and the light bulb were young. 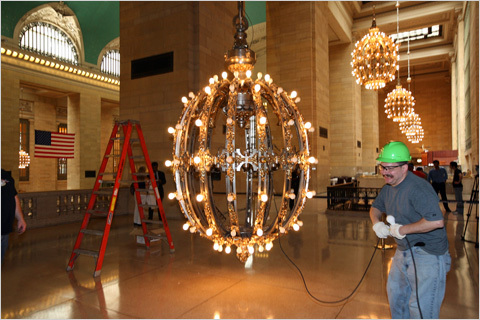 The bulbs in question were on one of the 10 huge Beaux-Arts chandeliers in the main lobby. Adorned with gold detail and banded with 110 bulbs, the 96-year-old globe-shaped chandeliers hang above the Main Concourse balconies like luminescent Fabergé eggs. Fluorescent bulbs last longer and use less energy, saving money and helping advance the city’s environmental goals. They were first installed in the terminal in the mid-1980s, with tube-shaped fluorescents hung on the train platforms largely to brighten them, said Marjorie S. Anders, a spokeswoman for the Metro-North Railroad. About seven years ago, compact fluorescents, which can be screwed into standard light sockets, were installed in the cornice that rings the ceiling of the Main Concourse, 75 feet above the ground, largely because frequently replacing the old bulbs was a risky and labor-intensive chore. And as the technology and aesthetics improved — the bulbs became less distinguishable and could be dimmed — the bulbs were added everywhere from the departure board to the chandeliers. Mr. Stroh would not even hazard a guess as to the number of bulbs throughout the terminal, which covers 48 acres on two levels, but he estimated that the annual light bulb budget was less than $100,000. Its costs about $1,100 to replace all the bulbs on a single chandelier. Replacing the roughly 4,000 bulbs in the public areas of the terminal — which doesn’t include the platforms, the train yards, or office space — will save an estimated $200,000 a year, Ms. Anders said. The payback on the initial investment will take just months. 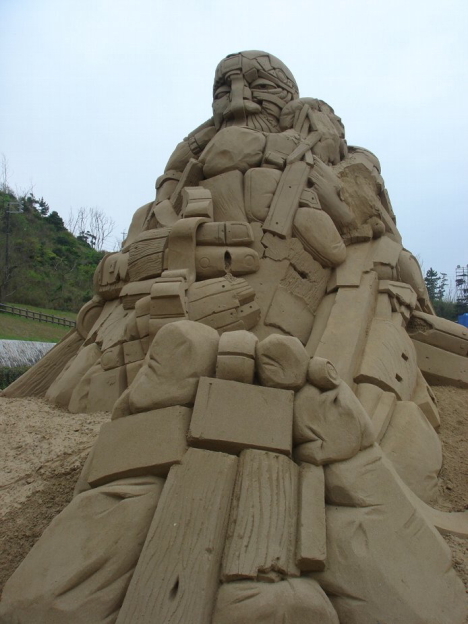 “Fairy tales and legends” is the theme of this year’s World Sand Sculpture Festival now underway at the Tottori Sand Dunes in Tottori prefecture. On display (until May 31) are 19 massive works crafted by world-class sculptors from ten nations. 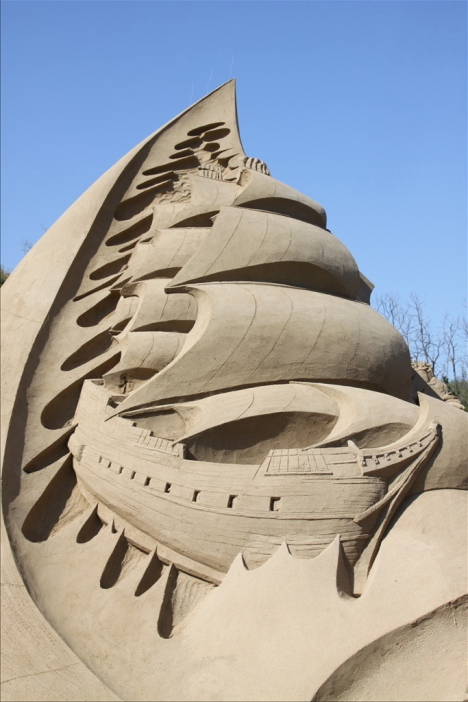 The artists used around 2,700 tons of sand and took about two weeks to complete their works. The location looks like a scene from TV drama Lost – a crashed airliner surrounded by miles of impenetrable jungle on one side and deep blue ocean on the other. But, in fact, the passenger jet is actually part of a luxurious hotel suite where highfliers can relax and enjoy the fantasy of being cut off from the rest of the world. The two bedroom suite is housed inside the fuselage of a 1965 Boeing 727 which was destined for scrap. Jutting out from a hillside, the plane offers spectacular views of the Manuel Antonio National Park’s rain forest in Costa Rica from balconies built on each wing. Inside the refurbished airframe are two wood-panelled bedrooms, a kitchenette, dining room and living area and two bathrooms. 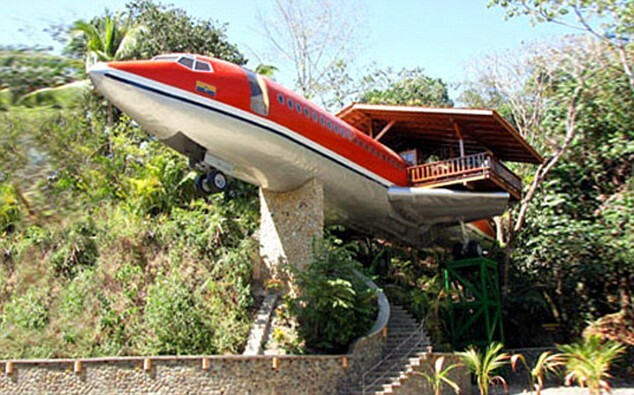 A spokesman for the Hotel Costa Verde described it as ‘the most exclusive hotel suite in Costa Rica’. The giant was transported piece by piece from the San Jose airport to its current resting place on a pedestal 50 feet above the beach. Five big trucks were needed to get the plane out to the resort, and while the transportation certainly had a negative ecological impact, the finished project is a stunning example of adaptive reuse. The hotel spokesman added: ‘At this height, you will enjoy scenic ocean and jungle views from the hard wood deck built atop the plane’s former right wing. Keith Green and Christine England spent three hours in make-up to walk down the aisle looking like the cartoon characters from the hit animated films. Mr Green, 44, and his 40-year-old bride were covered in green paint and full costume and wigs and married in front of 100 guests also dressed as characters from the film, including the Donkey and the Gingerbread Man. The new Mrs Green, a hospice nurse, of Barnstaple, Devon, said: “Every girl wants a fairytale wedding and I got one – with a bit of a twist. It was a real laugh. “The idea just came to me. 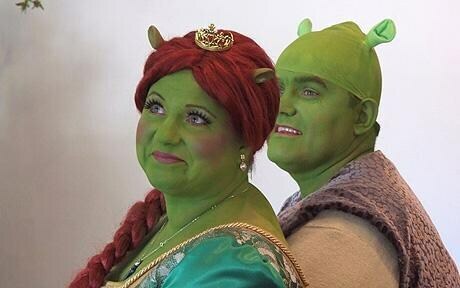 I knew what we would go as them because Keith looks just like Shrek. It was funny because when we said our vows Keith had these green ears sprouting from the top of his head. The couple hired a make-up artist to make them look like the characters – voiced by Mike Myers and Cameron Diaz – in the hit films. An advertising company is hoping that taste and smell based advertising will prove a hit with consumers. 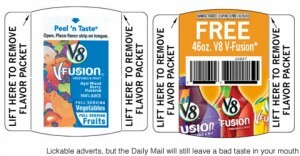 First Flavor’s Taste-It Notes resemble little sachets that can be peeled open to reveal a strip (substance yet to be confirmed) that has been impregnated with flavors and smells that match products on the page. We believe this type of sensory experience helps companies connect to their customers in a completely new and innovative way and drives product trial – and according to research reports conducted by our past clients, it works! Parishioners at a church in Sweden celebrated Easter on Sunday by unveiling a 6-foot-tall statue of Jesus that they had built out of 30,000 Lego blocks. It took the 40 volunteers about 18 months to put all the tiny plastic blocks together, and their creation shows a standing Jesus facing forward with his arms outstretched. The Protestant church was filled to capacity with about 400 worshippers on Sunday when the statue went on display behind the altar, and some of the children in the congregation couldn’t help but touch the white art work. Church spokesman Per Wilder said the statue at the Onsta Gryta church in the central Swedish city of Vasteras is a copy of Danish sculptor Bertel Thorvaldsen’s “Christus” statue on display in Copenhagen. He also said that even though the statue is all white on the outside, many of the donated Legos that the church received were of other colors and were placed inside. This is a remarkable young girl who is shining in the face of a major tragedy. This story is heart-wrenching, but there is something strangely inspirational about it. If you can… please take the time to buy a stack of cards or donate to the family. I know that I will! Watch this story with some tissue near by. It would be hard to say no to Reese Schroeder, a beautiful 5-year-old girl with a big smile and her father’s green eyes. But it would be impossible to turn her away from your doorstep once you hear why she wants to sell her cards. “Because I wanted to raise money for my dad because he’s in the hospital. But now, he’s not in the hospital anymore because he died,” she said. Jon Schroeder died early Tuesday morning months after he’d been admitted to the hospital for pneumonia. He was 29 years old. While at the hospital, he suffered a collapsed lung and was diagnosed with Acute Respiratory Distress Syndrome (ARDS), a rare and almost fatal disease. During her father’s long stay at the hospital, Reese’s kindergarten art teacher decided an art project might help. She kept Reese after kindergarten for two weeks and helped her draw pictures of animals that would be printed on cards. Julie Bauman didn’t even know the Schroeders but knew she wanted to do something to help. “Stacie (Reese’s mom) is now a single mom with little three kids and I just knew there would be a lot of possible expenses to keep the house going, I just figured anything we could do to help,” Bauman said. Bauman got a local printer to donate the card printing and then recruited volunteers to put the packets of cards together. She also brought Reese to her Monticello neighborhood to sell the cards to her neighbors. Jon never saw all of the cards while he was in the hospital because he was too sick. But he’ll be buried with them with a special note from Reese. “I feel kind of happy that he chose to go with Jesus, but I do feel kind of sad that he’s not with us,” she said. You can also buy Reese’s card from the Albertville Primary School, 763-497-2688. They are $10 for a pack of 6. The money will go to help Stacie Schroeder raise her three kids.